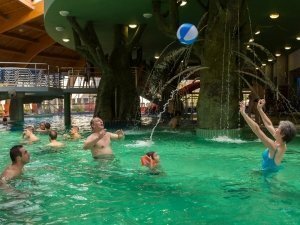 The Aqua-palace indoor bathinc complex will be closed between 22-26 of January 2018. Reopening on 27th of January, 10 am. 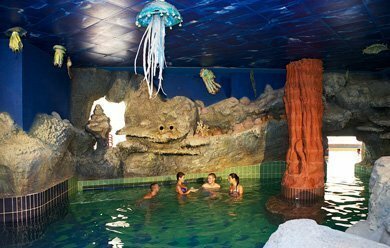 The Aqua Palace covered adventure bath awaits visitors since March 2010 throughout the year and it offers a wide variety of programs combined with bathing. 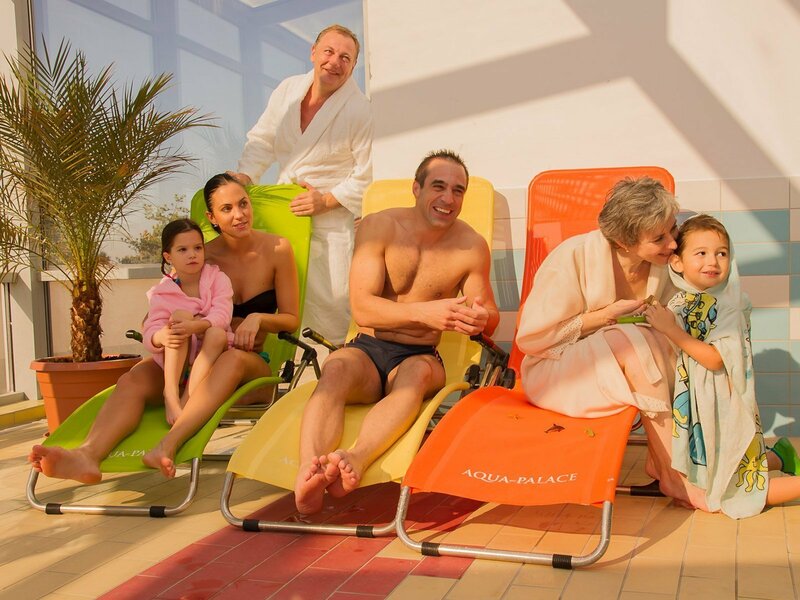 In the Aqua Palace – in addition to bathing and sporting services – guests may use the sauna section as well, where there are Finnish, infra and steam saunas, submerging and Kneipp pools, an abundant massage offer and not lastly a wide variety of catering units await the guests. The complex offers private services as well for the guests, from among these services the private bath and the relax room are outstanding ones. The adventure bath offers entertainment separately for the adults and for the children. A separate level has been established for the children, where in order to offer all kinds of services there are pools, chutes, a playing ground, a breast feeding and napkin unit, a baby pool, a jumping up and down unit and there is even a resting area for children. 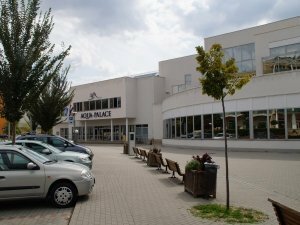 Children are special guests of the adventure palace of Hajdúszoboszló. The services established for them are safe, and during designing the establishment the needs of the children and the expectations of the parents were also taken into consideration. The 8 thematic pools established on the ground floor of the bath navigate the guests to the world of the different cultures of bathing with the aid of presenting the symbols of the different ages and cultures. The atmosphere of the ice cave bath makes relaxation special by recalling the cold climate zone of our earth. The Ganges spa takes the guests to the world of India, and in the pool decorated with the symbols of the religious world and culture of Asia the bathers may participate in a special spiritual refreshment. 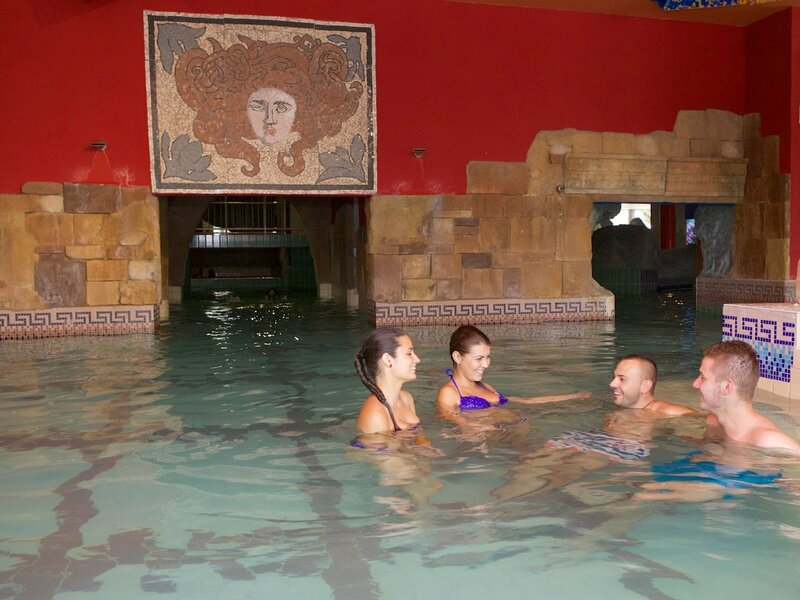 The Roman bath contributes to recalling an old glorious age, which was famous for its bathing culture, and it makes the time spent here extraordinary by recalling the memories of this culture. The uniqueness of the pool is ensured for the guests by the symbols and spectacular elements of the age. The style of the pool of the cave bath reflects the characteristics of a cave created in the solid crust of the Earth. The family pool of the ground floor pool area is the tropical bath, which carries away the imagination of the guests while they are bathing next to an alligator stranded on the ground. While using the serpentine chute one may become really encompassed by the atmosphere of the pool. The Movie pool improves the adventure of bathing by introducing short films with the aid of projectors. Its name refers to the cinema building that was once operated within the area of the bath. 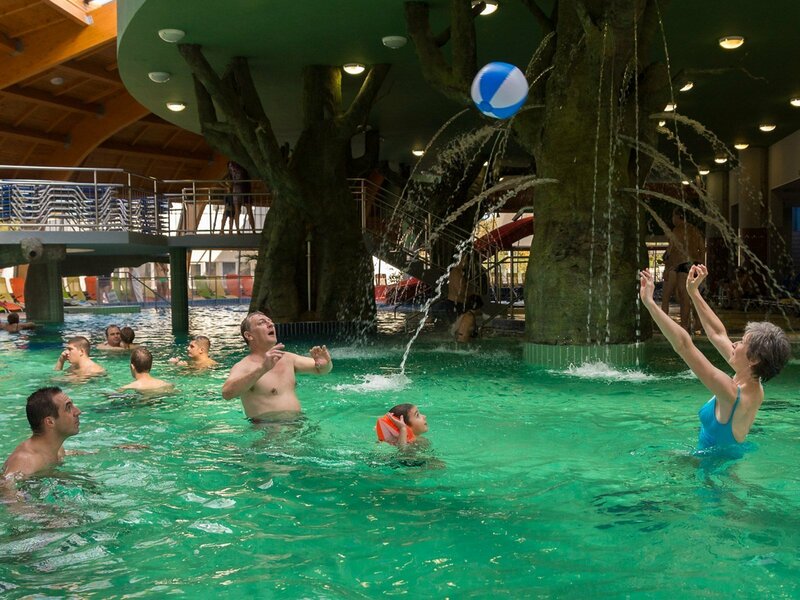 The sea bath navigates the bathers to the world of oceans and relaxation in the water becomes a special adventure due to the presentation of the characteristic animal world of the oceans. 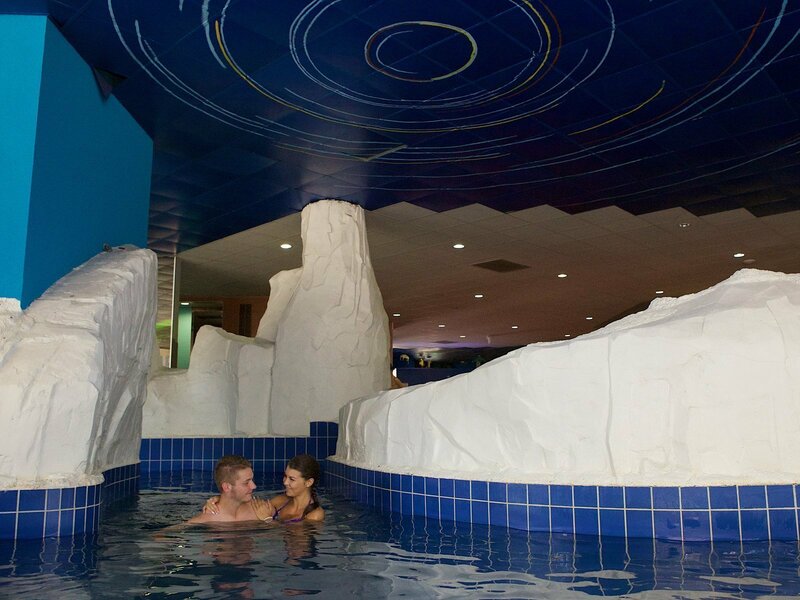 In addition to bathing, chutes have a special role within the service assortment of the Aqua Palace. The highest chute that encompasses two floors is more than 8 meter high and its complete length is longer than 74 meters. Only the older children and the adults may try this chute, however, this type of entertainment is ensured for the younger guests as well. Another part of the building is the Surfing Building, the name of which reflects well its character. The surfing pool offers entertainment for people interested in sports. The active programs, as e.g. 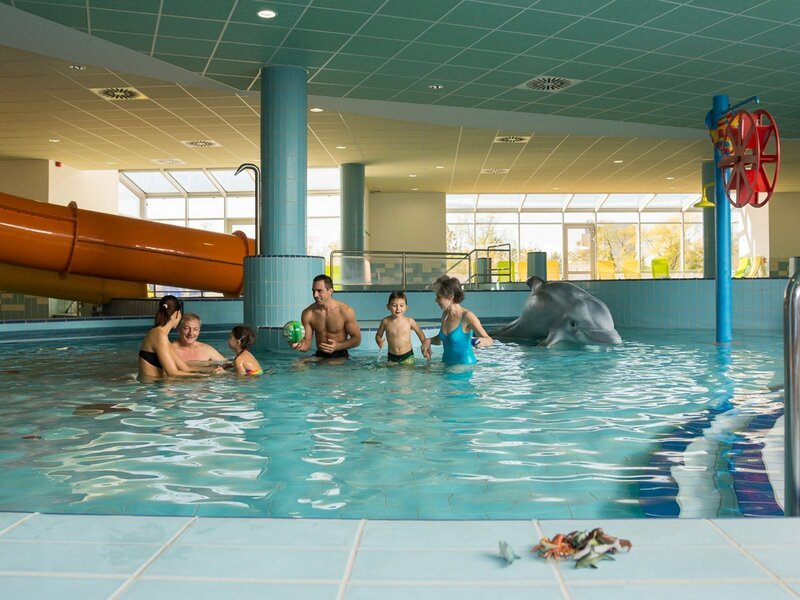 squash, table tennis, spinning contribute to the wide variety of services that are offered by the Aqua Palace adventure bath and the additionally organised physical exercise programs also serve this purpose. The physical exercise programs directed by professionals include Aqua Fitness, which is a water sport independent of age, and its efficiency is proven by practical experiences as well. Address: 4200 Hajdúszoboszló Szent István Park 1-3.